Hiya guys! It's your favorite polish girl finding herself once again sick as can be. Yes, again. At this point I'm not sure if it's a strong flu that is going around or my weak immune system. Maybe a little of both. Either way I'm trying to power through it and get as much swatching done before I get worse. So long as I'm not sick around the time of Polish Con I don't care, haha. But it's time to focus and enable you some more with another gorgeous polish. 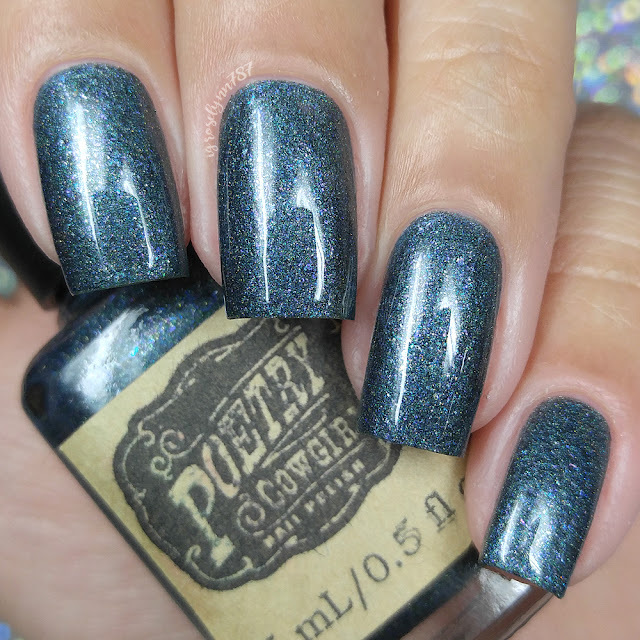 For today I'm sharing swatches for the Holo-maniacs Facebook Group Custom for the month of April by Poetry Cowgirl Nail Polish,. This an exclusive shade that will only be available for a limited run before it's gone for good. Without further ado, let's go ahead and get to the swatches! 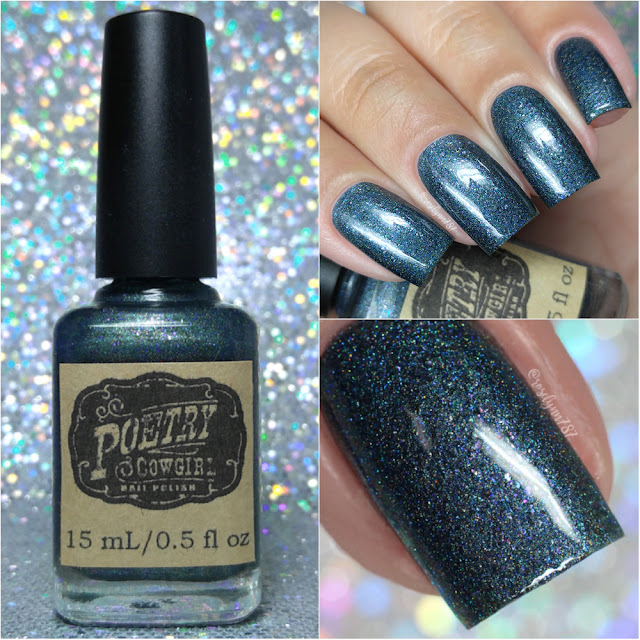 Pensive by Poetry Cowgirl Nail Polish will be available for purchase Wednesday, April 18th until Tuesday, May 15th at midnight. Each full-size 15mL bottle retails for $11.50, but you will need the code in the Holo-maniacs Facebook Group in order to make the purchase. In addition to the price reduction on this shade, the special group code will also give you 15% off anything else in the shop. 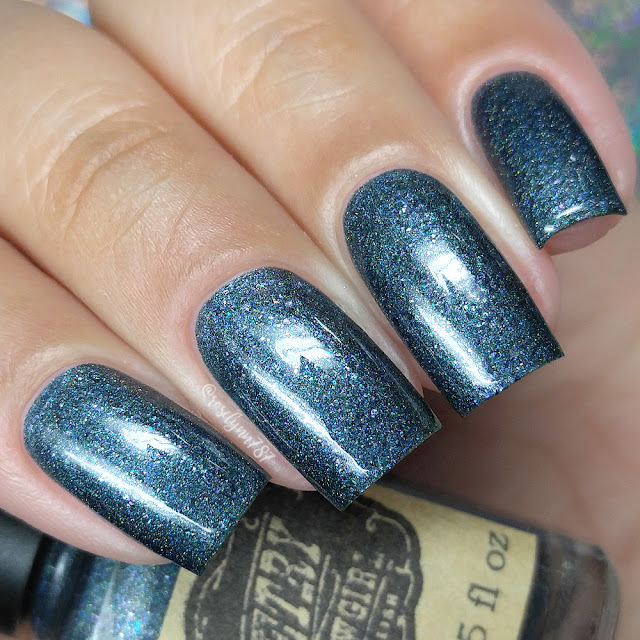 Pensive can be described as a dark charcoal grey holo with a hint of green shimmer, antique violet micro flakies, midnight flakes, and green, blue, and purple sparkles. Isn't this a gorgeous vamp?! I'm always drawn to dark shades no matter the season. 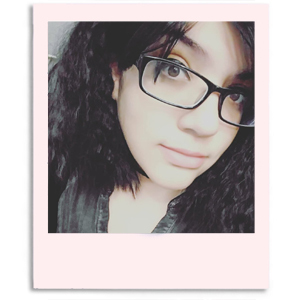 I think that's the little emo brat in me that peeks out from time to time, haha. That aside though, I love the combination of color and flakes in the finish. It adds a lot of dimension and sparkle, much more than photos could hope to capture. Plus the shade ends up looking lovely against my skin-tone. The formula has a really good opacity although not enough to be a one coater. It layers nice and even with none of the flakes clumping. Consistency wise it leans a little on the thick side, but it's manageable and didn't need thinner. As I mentioned before, the holographic finish comes off very subtle unless placed under direct sunlight. It dries down to a minimal gritty matte finish that smooths out perfectly after topcoat. I didn't experience any staining on removal to either my nail beds or cuticles. Shown in two coats and sealed with a glossy topcoat. To recap, Pensive by Poetry Cowgirl Nail Polish will be available for purchase Wednesday, April 18th until Tuesday, May 15th at midnight. Each full-size 15mL bottle retails for $11.50, but you will need the code in the Holo-maniacs Facebook Group in order to make the purchase. In addition to the price reduction on this shade, the special group code will also give you 15% off anything else in the shop.